With 45 accessories and a cutting board included, the Spring Promotion is not one to miss! Receive an 8100 as well as cutting, sanding and polishing accessories to have your garden furniture looking perfect for barbeques and outdoor parties this spring season. To celebrate the incredible projects that Dremel users across the country create on a daily basis, we launched our very own Dremel It Yourself Club earlier this year. Keen hobbyists, from those who enjoy the likes of crafting, making, restoring and DIYing to name a few, are invited to join the Dremel It Yourself Club (DIY Club). The first challenge; set in early February asked DIY Club members to share ways they have used their handy skills to benefit someone else - how members created ‘DIY for good’. 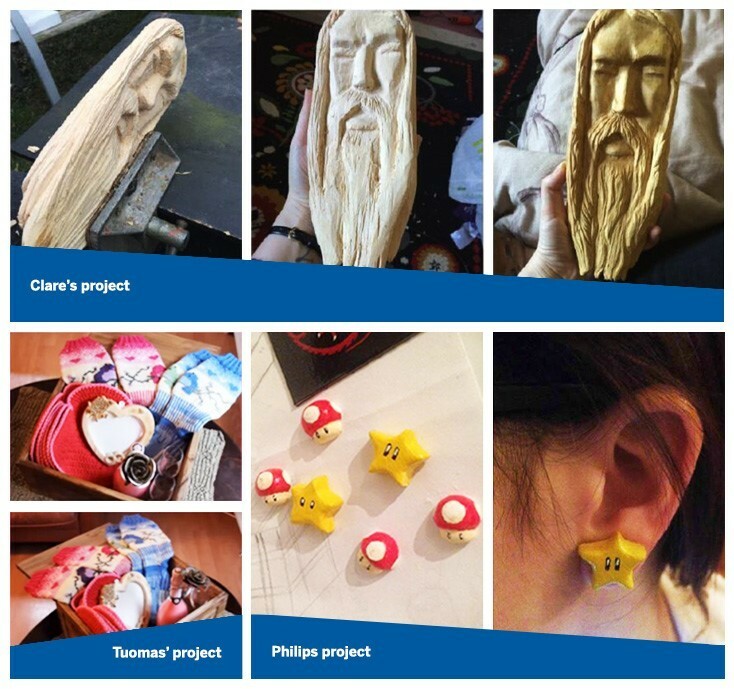 Working for a charity called Hamelin Trust, based on providing support for children and adults with learning disabilities, Clare has recently showcased her skills with Dremel tools by taking up wood carving. The extraordinary pieces created by Clare are hoped to be sold in order to raise money for the Hamelin Trust. Here’s one of her first projects. Keep up the great work Clare. There’s nothing better than a hand-crafted gift. Philip decided to put his skills, creativity and Dremel Multitool to the test, in order to make a very special gift for his wife. Phillip combined his wife’s love of earrings and a certain classic computer game, to create genius works of art. Phillip successfully surprised and delighted his other half. We were pretty impressed too! Bringing education to life and integrating the latest print tech solutions to the classroom, Dremel has now unveiled its next generation of 3D printer – the 3D40 Idea Builder – and has launched an innovative education initiative to mark the launch. Dremel’s 3Ducation Ambassadors programme is a nationwide search to find schools and colleges looking to enhance their students’ development with the aid of 3D printing technology. Three 3Ducation Ambassadors will be chosen – one primary school, one secondary school and one college or university – each will be selected based on their ideas for what they plan to print first if they were lucky enough to win. Each winning institution will be rewarded with a new Dremel 3D40 Idea Builder and will be required to provide photos, videos and information about the different projects their classes work on with their 3D printer. From 3D file building and problem solving, to sparking creativity and making STEM (Science, Technology, English and Maths) even more engaging, the 3D40 idea builder pulls together a wide spectrum of elements from across the school curriculum. You can view a selection of classroom 3D printed objects in our 360-degree virtual tour here. Making it simple to incorporate 3D printing into lesson plans, this latest model comes complete with a wide range of 3D files readily available that slot into the curriculum. Plus there is access to a host of downloadable project files including cell transformation kits to measuring equipment and the 3D40 can be used to encourage students to create themed objects or even design 3D files from scratch. The deadline to enter Dremel’s 3Ducation Ambassadors competition is 25 November 2016. For further information, visit our Facebook channel. There may be many niggling DIY jobs around the home which are not big enough to get someone in but not small enough to go unnoticed. Or perhaps you just don’t want to part with that old piece of furniture that belonged to a relative. Armed with a Dremel tool and some elbow grease, there is plenty you can take on if you fancy trying to ‘Dremel It Yourself’. To save throwing away rusting garden furniture, blunt shears or even having to put up with a lime scaled basin tap, a surprising amount can be achieved if you have the right tool for the job. There is even scope to turn something you may have thrown out into something completely different. 1. Refinish metal patio furniture – simply sand off old paint and transform your metal patio furniture with the latest shades for an impressive look for a fraction of the cost. 2. Removing Rust from garden tools – a steel brush attachment on a Multitool can work wonders to clean and sharpen dull blades. 3. Replace a chair spindle – a loose spindle needn’t mean you have to part with a family heirloom. Simply use the cutting tool on a Dremel Multitool to smooth and remove any old glue, stick silk thread around the spindle end and finally secure it to the chair. 4. Replace a rotten wooden window sill – unsightly wood rot can spoil the look of a window. Beat the bad weather and remove rotten sills before replacing with lovely new one, gluing in place, filling sanding and painting. 5. Cleaning your BBQ – armed with a Dremel Multitool, oxide grinding stones and abrasive buff accessories, and you can take years, and rust, off your barbeque and grill. 6. Changing tiling in a bathroom – don’t put up with a few broken tiles. Chip the broken ones away and the Dremel Compact saw and edge tools can help you cut and shape your way to fresh new tiles - even around difficult shapes. 7. Restoring an old piece of furniture – rescuing an aging chest of drawers can be a task to be proud of using the EZ SpeedClic Abrasive Buffs to make lighter worker of sanding difficult areas and the polishing accessories to shine up existing handles. 8. Clean up skirting boards – sprucing up tired or worn skirting boards can make a real difference when it comes to smartening up your home - and it can be surprisingly simple. 9. Create a reclaimed table – An old pallet can prove great inspiration for a table. There is even scope to add a lovely planter in the centre for a unique finish. 10. Turn something old into something new – before you throw away old wicker baskets, have you thought about turning them into lovely lighting? A simple hole cut in the bottom can make all the difference. Further DIY inspiration plus project for your car, sporting and craft projects can be found on the Dremel website. So grab the weekend and give it a go. 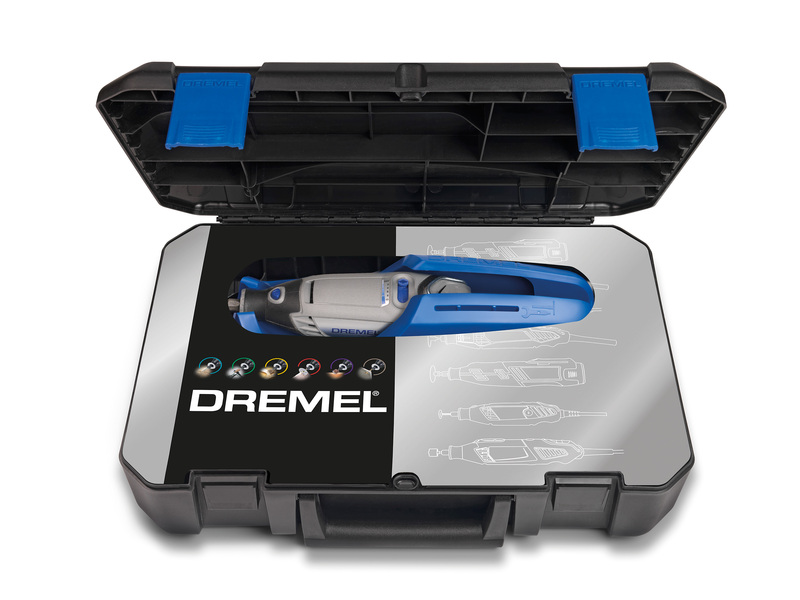 Dremel tools start from around £35 for a Dremel 200 series Multitool to £190 for an Ultimate Dremel 4000 Platinum Kit. Clearing workstations of messy power cords - and removing the frustrating task of getting your power tool back in the box after use - Dremel has added extra value to its three most popular corded Multi-tools with the launch of an innovative new EZ Wrap tool holder with a dedicated area for attachments, to make finding exactly what you need hassle free. The light-weight EZ Wrap tool holder comes as standard with the new corded 3000, 4000 and 4200 Multi-tool EZ product kits. Designed to store your Multi-tool so you can find it easily, the handy built-in cord channel means you can simply wrap the cord around it when finished for speed and neatness. This handy addition to the range can also be wall-mounted so your Dremel will never be far from hand, whilst an on-board wrench and accessory storage section keeps everything you need accessible. As well as the new EZ Wrap tool holder, each of Dremel’s new EZ product kits comes complete with a spacious and sturdy storage case with a removable accessory tray, providing an improved quality feel and look. As well as the solid case with removable tray, this kit features the corded Dremel 3000 Multi-tool complete with the EZ Wrap tool holder, 25 accessories which allow you to go from cutting to trimming to polishing at speed, and a number of EZ SpeedClic accessories that simply click into place. The set also includes the high quality Dremel Flexible shaft for more detailed work. Combined with a resourceful fan design and side vents, the ball bearing motor construction of the 3000 creates a cool-running tool with low noise and vibration, even under high load. Great value, the 3000 – 1/25 EZ kit costs around £71.99. 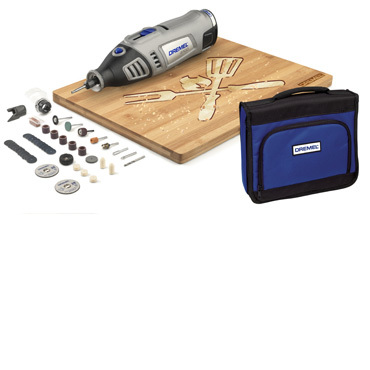 The Dremel 4000 EZ product kit includes the high performance 4000 Multi-Tool with a 360° soft grip handle for greater maneuverability, and an EZ Twist Nose Cap so no wrench is needed to change accessories. The rotary speed is fully variable and has a separate control to ensure precise use, whilst the high-performance motor with electronic feedback means you have consistent, maximum force. Giving additional options for the more experienced hobbyist or DIYer, the 4000 – 4/65 EZ kit contains Dremel’s Flexible Shaft, Line & Circle Cutter, Detailer’s Grip and Shaping Platform attachments, alongside a further 65 original Dremel accessories. As with the 3000 EZ kit, the case, removable accessory tray and the EZ wrap tool holder feature as standard. The 4000 - 4/65 EZ wrap kit is priced at around £115.99. 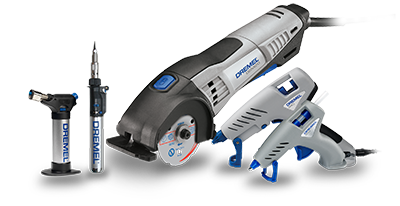 For the enthusiast, the 4200 – 4/75 EZ kit includes the top of the range Dremel 4200 with variable speed control, electronic feedback and Dremel’s EZ Change fast accessory change system. Simply pull the side levers and swap the accessory as needed. Providing options for a wide range of jobs and crafts, the 4200 EZ kit includes a Cutting Guide, Line and Circle Cutter, Shaping Platform, Comfort Guard attachments and 75 accessories. The new EZ wrap tool holder, solid case and removable accessory tray feature as standard. The 4200 – 4/75 EZ product kit costs around £139.99. Coverage from the Mirror UK. 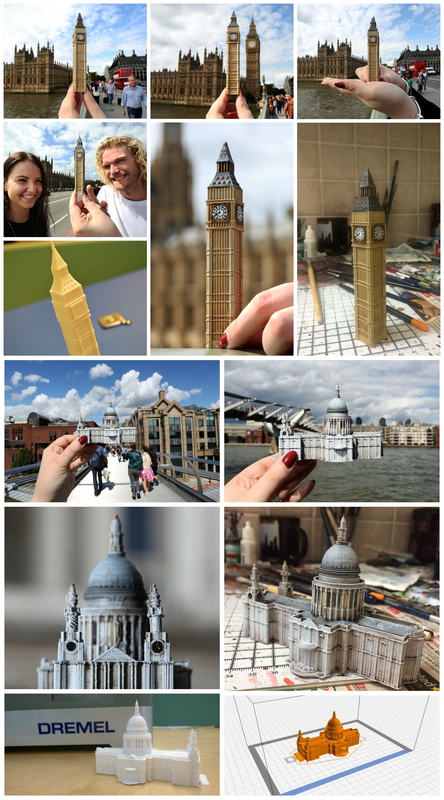 Dremel launched the 3D Idea Builder, by recreating some of London’s most loved landmarks with precision. The architectural icons included Big Ben, Tower Bridge and St Paul’s Cathedral, which were all recreated in a 3D model format with high detail. Building these beautiful models, took the Idea Builder between three to six hours to print. After they were printed, the buildings were hand-painted to capture the realism of each landmark with careful, precise brush marks. The end result, as you can see, was astounding. “The only limit is your imagination and we’re encouraging everyone, whether they are a keen crafter, DIY-er, specialist designer or simply a family who want an appliance that can make them anything that they can think of, to get printing…and build on their ideas. Each finished model, when printed using the Idea Builder, is easily removable from the platform. The model will be strong but lightweight, allowing you to sand it down for a smoother finish, paint it for a more “realistic” feel, or add something creative of your own for a more personalised touch. The only limitation is your imagination. Buy an Idea Builder today, and see where your imagination takes you. 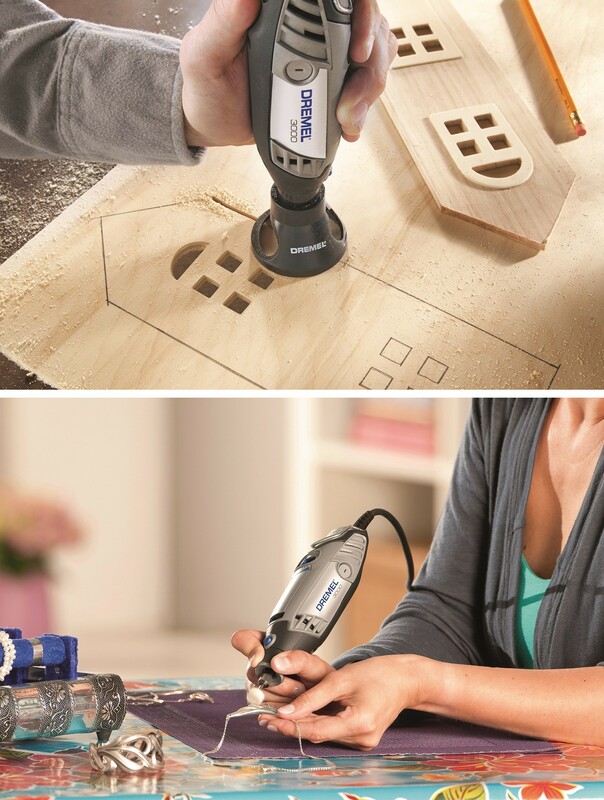 We asked Dremel experts and users from all over the world about the tasks they love to complete with their Dremel tool. We were inundated with lots of fantastic suggestions and have created an infographic to demonstrate ten of our favourites. Here are our Top Ten Golden Dremel Applications.